Ensure your four-legged friends aren’t left out this Christmas with these easy recipes for homemade Christmas treats for dogs. Just because they can’t have chocolate, our dogs don’t have to miss out on having yummy things to enjoy over the festive period. Here are two easy recipes that your four-legged friend will love. Preheat oven to 175°C. Line two large baking trays with greaseproof paper. Mash the ripe banana in a small bowl, grate the carrots, and mix with the banana. Add the applesauce and 30ml of water to the banana and carrot mix. In a medium bowl, whisk together the flour and oats. Make a well in the centre of the dry ingredients and pour in the carrot mixture. Stir until thoroughly combined then knead the dough in the bowl with your hands. You can add the remaining 30ml of water if needed to combine all the ingredients. Roll out to 1.5cm thickness, then cut into shapes using cookie cutters – a Christmas tree or gingerbread man would suit the season, or a good old bone shape. Arrange on the baking sheets. Bake for 25 minutes. Allow to cool completely before serving. Store at room temperature or in the refrigerator for up to 3 weeks. Or keep them in the freezer for up to 6 months. In a measuring bowl, crack the eggs and add milk or water to double the volume. Using a fork, mix well to blend. Using a blender, liquidise the liver to a smooth consistency. Mix in the egg and milk/water mixture to the blended liver. Then in a large bowl combine with the flour. You’ll find it will turn into a sticky, dough-like consistency. Transfer into lined baking tray(s). You could be creative here and make them in a silicone mould – there are a variety of shapes from bones to paw prints available online (if you decide to buy some check out our ways to give for free this Christmas blog – you can donate to us at the same time as spoiling your dog!). Pop into the oven at 180 degrees for 75-90mins. Check on the cake at around 75 mins – the top should be darkened and should bounce back when pressed lightly. These treats will last in the fridge for 2-3 days and in the freezer for around 3 months. 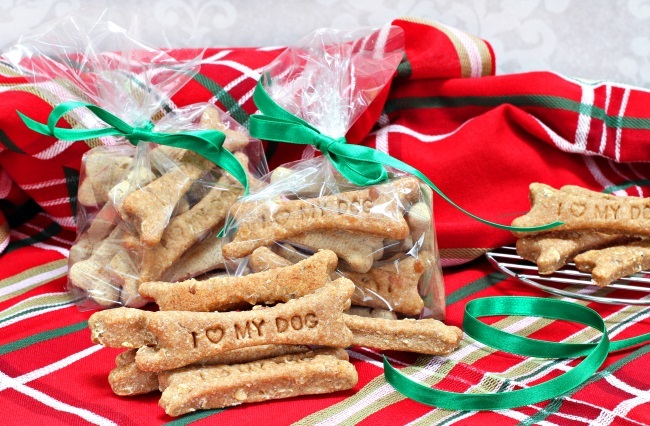 We hope you enjoy making these homemade Christmas treats for dogs! We’d love to see your dogs enjoying their special treats, so if you share your photos on Facebook, Twitter or Instagram please tag us – @DogsForGoodUK and #dogsaregood. View How are dogs helping people with dementia? What does it take to train an autism assistance dog?